Last year I revisited James Baldwin’s “A Talk to Teachers” before starting the school year. I encouraged myself and other teachers committed to social justice to “go for broke.” I did lots of work I felt proud of in our classroom last year, working with our 5th graders to understand, analyze, and combat racism. They culminated the unit by presenting their research at a conference at the Museum of the City of New York. But, after a summer learning and reflecting a lot about internalized white superiority, I’ve come to some clarity about what it means to “go for broke” this year. It has been easy in some ways to talk to kids about racism. In these conversations, as the teacher, I still maintain the authority that conserves my psychological safety and white superiority. The real work this year is to talk to other white teachers. I have known this for some time. But I’ve found a myriad of reasons to avoid most of the hard conversations I know should happen. I didn’t think I had the relationship necessary to “call in” one white colleague. I doubted it would have any effect. At the heart of it though was just a fear of conflict. The stakes attached to these decisions became clear this summer when listening to an interview with Robin DiAngelo, author of White Fragility: Why It’s So Hard for White People to Talk About Racism. 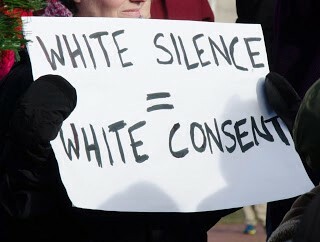 In the interview, DiAngelo describes the concept of “white solidarity” as maintaining the comfort of other people, even in the face of racist behavior. In prioritizing white comfort over truth-telling, I allow racism to go undisturbed. I have to apologize here to the people of color in my life who have encouraged and cajoled me to speak up previously. It should not have taken an article, book, or podcast to shift my thinking. But nonetheless, the concept of my behavior as actually being in solidarity with white supremacy felt like a new realization. Step 1) Hear or see something problematic from a white colleague. Step 2) Think to myself, hm, that seemed messed up. Step 3) Think to myself next, well, maybe they didn’t mean it that way. Step 4) Think to myself after that, well, I’ll keep my eyes and ears open to see if they say/do something else. Then I’ll know I should do something. It’s past time to go beyond “understanding” systemic racism. The reading, listening, and reflecting are valuable. I have learned a lot, and genuinely feel that I’ve grown. But it’s time for me to push into an area of true discomfort for me. It’s time to focus on “calling in” and building relationships with other white teachers. When I feel afraid, I need to remember… What do I have to be afraid of? As a white man in America, there are practically limitless opportunities for me to mess up, and most likely still be protected from harm. This protection is psychological, financial, and physical. And if I’m not willing to risk the slightest portion of it, then my purported commitment to ending white supremacy is meaningless. With that in mind, here are some commitments I am making to myself. I am making them publicly, in hopes that I will keep myself accountable. These commitments are the result of a lot of love and patient dialogue with my partner Megan Madison, conversations with a community of white educators I’ve connected with on Twitter (many of whom are active in Val Brown’s #CleartheAir chats), a calling in workshop presented by Showing Up for Racial Justice (SURJ) NYC, and my own reflection. 1) Speak up. First and foremost, I need to stop over-thinking and over-strategizing. I need to say something, anything, that disrupts racism when it arises in my teaching community. If I mess up, I’ll take responsibility for it, and commit to doing better. 2) Be humble. When I speak up, I am not in a position to shame or punish anyone. I have fucked up countless times and I continue to do so daily. I need to tell my own story of failure and internalized or interpersonal racism. 3) Be loving. Related to being humble, I need to remember that the white people in my life are a part of my community. If I want to be a part of building a community of liberation, I cannot do it by distancing myself (See point 13 here) from them or throwing them away. I want to say more about this idea, but I’m not sure I can articulate it concisely here. Being loving also applies to myself. I will mess up. If I give in to good/bad, black/white thinking, I am not giving myself the space to keep learning. These are my commitments to myself this year. I know they’re imperfect. But if I can stick to them, I may bring my practice into closer alignment with my values. Thank you for your honesty about this topic. I am a displaced black teacher from California and I feel this silent racism you speak of is keeping me out of certain schools in my diverse state. I never thought my race was an issue up until some personal experiences made it clear to me. When blacks use the race card we are often blamed for the silent racism, I call it, and are told to get over it, but I have learned it is our own bias that we need to check. I hope to shed light on this topic some more. I remember when I was studying to become a teacher. I was the only black in my cohort and when we discussed bias and how we bring our own biases into the classroom, it was eye opening to see what my colleagues thought, who were white, some of which because of white solidarity had no idea they even had a bias. Its so unfortunate we allow the color of our skin to dictate how we treat others.